NYC residents and community groups: we’re excited to feature your comments on NYC Councilmatic pages, and deliver your group’s feedback to city council offices for a public response. Here’s how to comment on legislative items on Councilmatic, such as on the 2015 “Uber bill” (to study for-hire vehicles in NYC) currently featured on our homepage. 1. Visit the page of any legislative item on Councilmatic , and click on the comments tab (see below). Search for keywords you’re tracking, or from your council member, etc. 2. Enter a quick comment and then select one of the options below – login with one of the social media options, or sign up with Disqus with an email and new password. 3. If you click a social media button, e.g. for Twitter, Disqus will simply bring over the avatar from your Twitter account (the one logged-in in your browser). You’ll briefly register your new Disqus account in a pop-up window, with your email and password. If you use a new email, you can set an avatar of your choice, of course. 4. Once your Disqus account is registered, your comment will be pending. Councilmatic site admins will be notified over email that your comment is awaiting moderator review, and we’ll publish it right away. If you don’t see it shortly, ping us to let us know, we’re easy to reach! 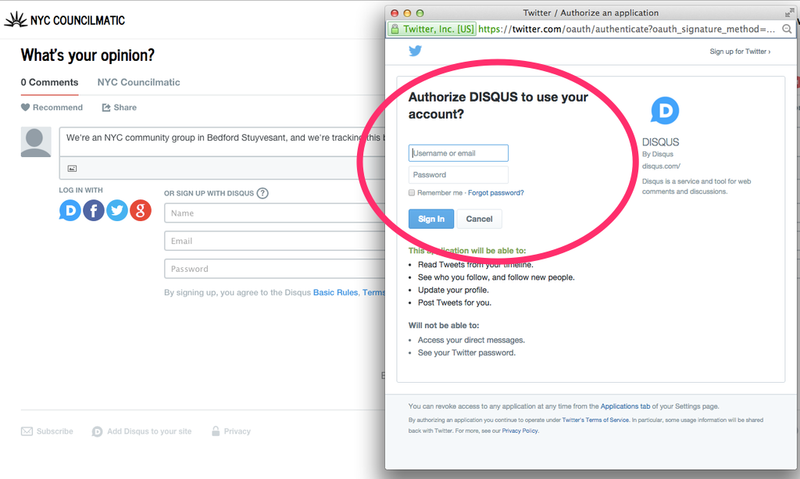 Groups are free to register more than one account on Disqus, to comment on Councilmatic bills – for example, one using your organization’s Twitter name (e.g. @NYC_community_group), or one using your personal Twitter account (e.g. @Sam_community_group), or both. We’re happy to help with questions along the way, takes just a minute – contact us with questions. More info on the public comment program with “verified” city council offices and regional media partners, and a look ahead to an example discussion on “AirBNB” bills. In the near future we’re working to support comments on more than legislative items – for example, city council committee meeting agendas and minutes, and more. Email us: admin at councilmatic dot org, or instant-message me, davdimooreppf on Skype. Happy to share my mobile number with community groups as well, get in touch.